LT-Accelerate is a unique event, the only European conference that focuses on business value in text, speech, and social data, taking place this year November 23-24 in Brussels. LT-Accelerate participants represent brands and agencies, research, consultancies, and solution providers. The conference is designed for learning and sharing, networking, and deal-making. Please join us! Visit lt-accelerate.com for information and to benefit from the Super Early registration discount through September 15. 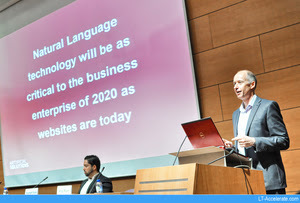 LT-Accelerate is an international conference produced by LT-Innovate, the forum for Europe’s language technology industry, and my U.S. consultancy, Alta Plana Corporation. Participating speakers hail from Austria, Belgium, Bulgaria, France, Germany, Ireland, Portugal, Spain, Sweden, the UK, and the United States. Speakers will present in English. Program information and registration are available online at lt-accelerate.com. Please join us 23-24 November in Brussels! P.S. We have program space for a few additional brand/agency speakers, and we welcome solution provider exhibitors/sponsors. You or your organization? Contact us! ← Is There Value in Venture Scanner’s Iffy AI Funding Research?